Grace Nickel has a BFA in Ceramics from the University of Manitoba and received her MFA from NSCAD University in Halifax. Her work is internationally recognized and she has received numerous awards in overseas competitions, as well as Manitoba Arts Council and Canada Council arts awards. Grace Nickel’s Devastatus Rememorari exhibition will run from July 18th to December 6th, 2015, at the Art Gallery of Nova Scotia. This show is a ceramic tribute to the awesome, random forces of nature and man’s attempts to understand and control the resulting chaos. 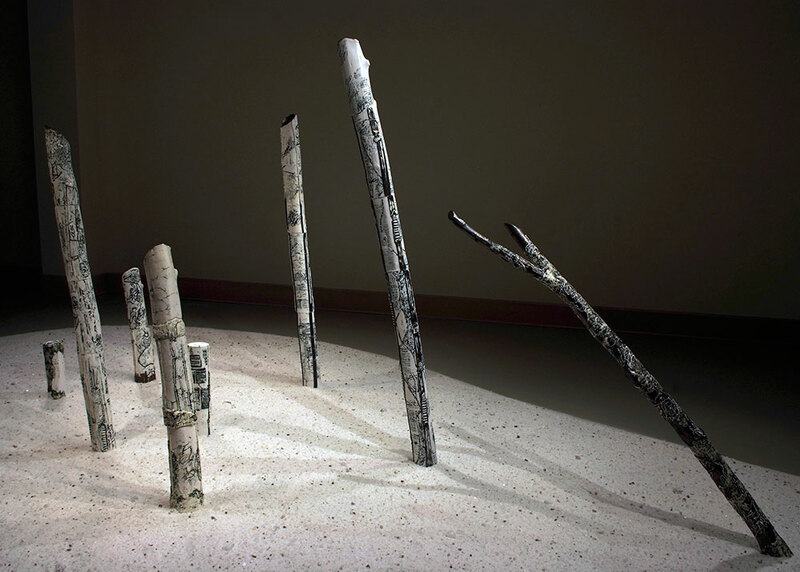 In Devastatus Rememorari, eight porcelain stacked casts of trees covered in white, black, bronze and subdued green glazes are arranged on a tear-shaped bed of rock salt, a symbolic representation of Hurricane Juan which tore through Nova Scotia in 2003 ripping trees from Point Pleasant Park in Halifax. This installation is an invitation to pause to remember our own personal experiences with the hurricanes, floods and other natural disasters that surprise us occasionally with their brute force. This piece is considered a gift from Nickel to all the citizens of Halifax who lived through the awesome and horrible experience of Hurricane Juan. Its power lies in the fact that it resonates not only through one specific event, but it can be read as a tribute to all trees devastated through natural phenomena.